The more prices grow, the more they will eventually fall. The more the prices fall, the more the damage done to the economy and to the lives of the average people. Even the central bankers sometimes admit the undeniable truth: rising home prices are a clear threat. It is both frightening and sad that the majority of Canadians were brainwashed to believe that rising real estate prices was a good thing. The good times during the onset of the housing bubble are both addicting and euphoric. It's too bad that the party can't continue forever. Just like after a night of excessive drinking and fun comes the toilet, headache and thoughts of never, ever drinking again. Similarly, after the boom comes the bust, with less jobs and more debt than ever before. It's funny how Toronto swore that a housing bubble would never happen again, and now two decades later we are finishing up the final drink of the night! 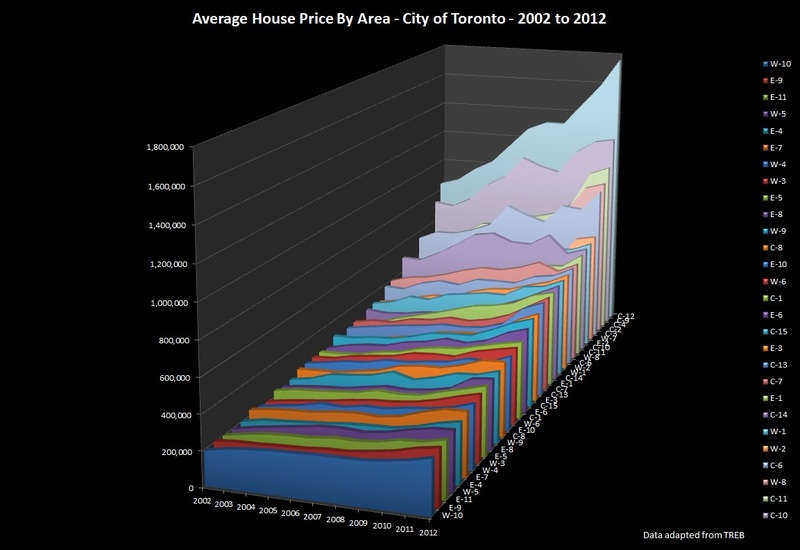 Over the past decade the average real estate growth in Toronto was over 6%. Some neighborhoods grew less, others grew more. Just like with booze, the more the home prices grow in a district, the more chances of a severe decline.The more drinks one has, the likelier one will get sick. The more expensive the neighborhood, the more volatile it is - at least that's the impression that I get from the picture below. Note that the neighborhoods are sorted from least expensive to most expensive. For the district abreviation map click here. The sooner we stop believing in the myth of rising housing prices, the less hang over we will experience in the future!